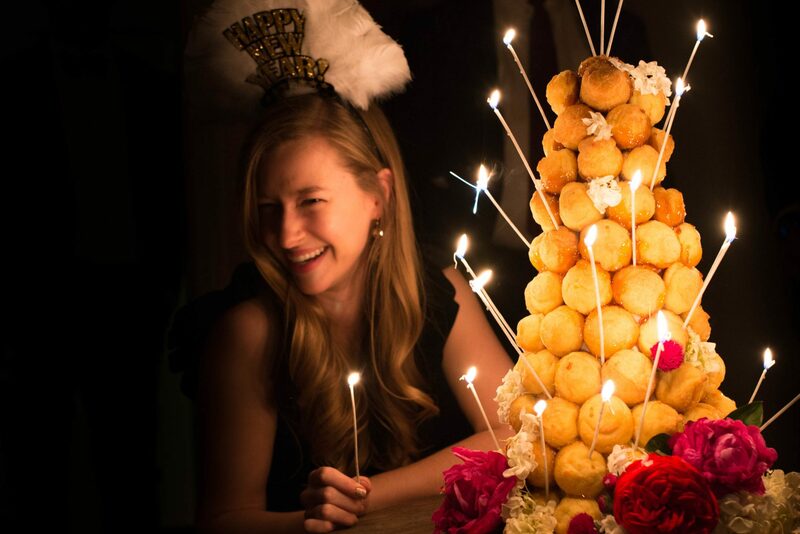 Sarah has always wanted to make a croquembouche since she watched Martha Stewart’s Christmas special on television as a little girl. 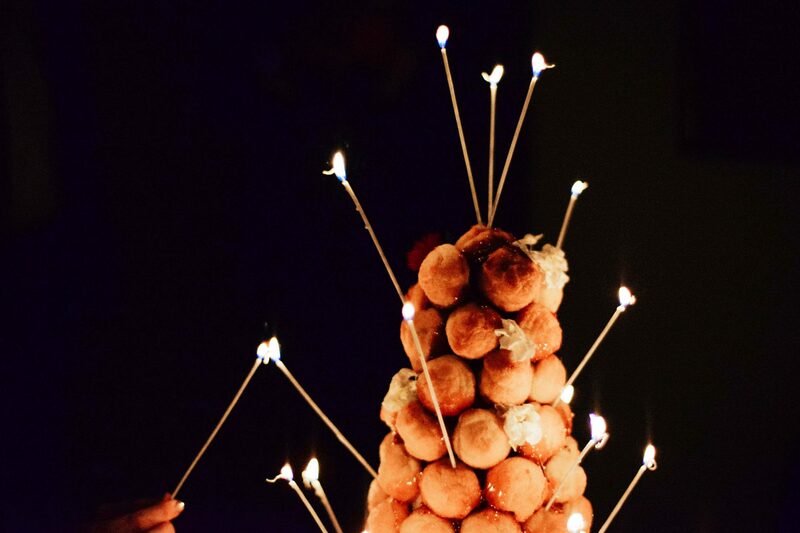 In France, croquembouches tend to be made for weddings and baptisms. We thought our New Year’s Eve would be the perfect occasion to attempt the bouche. 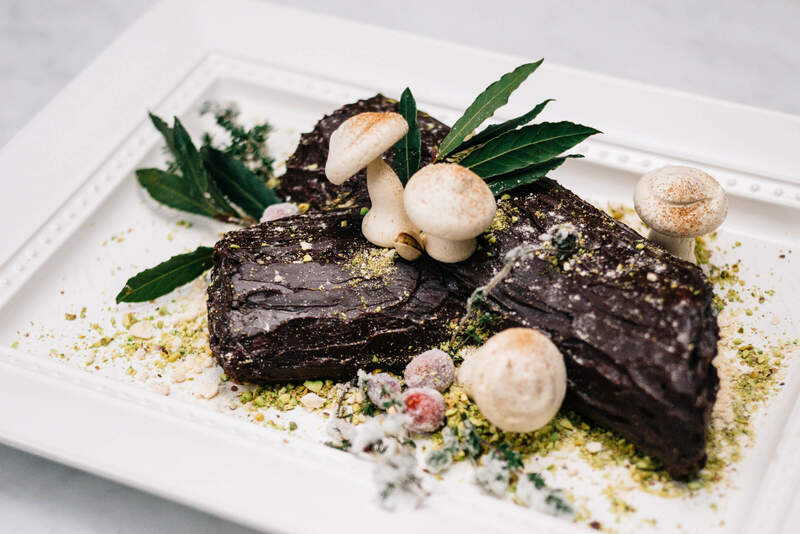 See more from our party in this post. Croquembouches are cones made of cream puffs, filled with delicious pastry cream, and stuck together with caramel. The word literally means “crack in the mouth,” and that’s what it does. The caramel acts as a glue to hold all the cream puffs together, and hardens so much that you need to break off each puff. It was a hit at our party and so much fun that everyone was breaking off individual puffs and eating them directly off the bouche. We’ve made Tyler Florence’s profiterole recipe for years and have never had any trouble with the recipe, so we thought it would be a relaible base for the pate a choux to make the cream puffs. Many croquembouches that we saw online were lumpy and assymetrical, and as perfectionists, we wanted a perfectly straight one. We made a cone structure out of two silpats and parchment paper. You can find silpats here. We stuffed the inside of the cone with more parchment paper for extra support, although you probably don’t need it since the cream puffs are so light and the caramel sets so hard. You should be able to pull the croquembouche off the mold after it’s assembled, but we needed to transport it across town and decided to leave the mold in place for extra support. For an easier option, you can get a pre-made mold here. We’re considering buying one. For a complicated pastry like this, it’s extremely important to get the right tools. We highly recommend purchasing a filling tip. You can get them here. We couldn’t have properly filled the cream puffs without it. 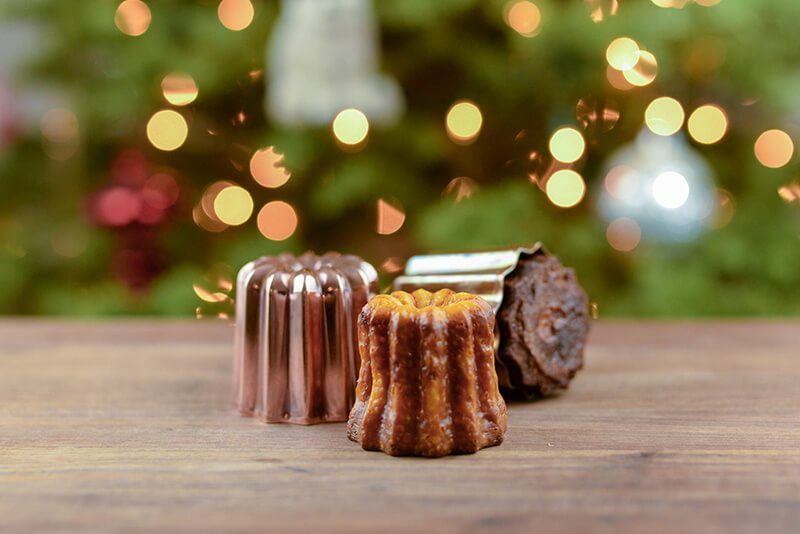 As you create your bouche, you’ll naturally get beautiful delicate strings of caramel. You can always add more at the end of your bouche. Check out photos from our New Year’s Eve party with here, and view more of our recipes from our New Year’s Eve party here and here. Make the cream puffs a consistent size. As soon as you take them out of the oven, move the to a cooling rack and pierce the bottom of them with the filler tip. Piece all of the puffs before moving on to filling them. This will make it much easier when you go to fill them and will allow them to cool better. You can also freeze them at this point after piercing them. Whip the egg yolks and sugar until they form a ribbon when you lift the whisk out of the bowl. Add the cornstarch. Heat the milk on the stove until boiling. Slowly pour the scalded milk into the egg mixture until it’s all incorporated. Pour the mixture back into the pan and heat until it comes to a slow boil constantly whisking it. Once it thickens, take off the heat. Add the butter, vanilla bean paste, and rum. Allow to cool and refrigerate until you’re ready to use. You can use a different flavor if you prefer. Put the cream into a pastry bag with the filling tip attached. 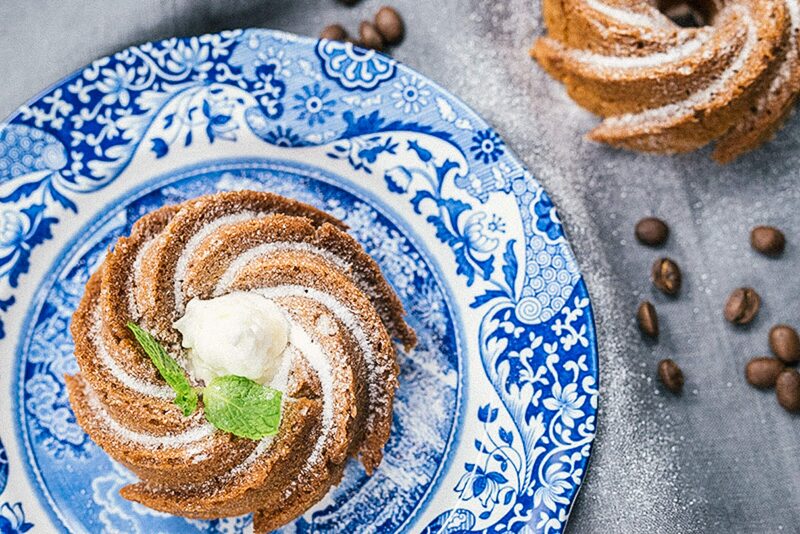 Fill each puff with cream. A little may spill out the bottom. We found that pushing it up to the top (not through) and slowly pulling it back out with slight pressure filled them well. You will be able to feel that they are heavier when filled. If you have time, you can return your puffs to the fridge until you’re ready to assemble. Heat the sugar and water in a pan. Using a candy thermometer, heat until it reaches the caramel stage and take off the heat. Take each puff and slightly dip it into the caramel getting parts of both sides. Begin to build your structure with a base and work up in concentric circles. Warning: the caramel is hot and you may burn yourself so be careful. You may want to double the caramel and make it in a larger pot to make it easier to dip without burning yourself. You need more caramel than you anticipate, and next time, we plan to use tongs. What a beautiful site I love your recipes and photographs.